It’s not uncommon to see a bumblebee lying drowsy and confused on the ground. Why do you see them doing this, and should you do anything to help? Scanning forums for insight reveals that the jury is out on what’s going on with these bees. A mixture of cold, exhaustion, hibernation and hunger are mooted, with some people suggesting that the bees are trying to warm themselves up, which is why you often see them on paving stones, and others suggesting that bees on the ground are hungry bees and need to be fed. So, yesterday the Brazilian and I were walking through Bruntsfield on the sunniest weekend so far this year, each grasping an enormous ice cream from The Chocolate Tree and thinking that life was pretty dreamy. As we strolled along, trying to ignore the slightly biting April wind, I spotted a bumblebee crawling along the pavement right alongside the park. Having read somewhere that this bee likely wanted feeding, I snapped off a nearby daffodil flower (sorry, Edinburgh Council) and held it out to the bumblebee. It immediately took notice and crawled straight towards and inside the yellow trumpet. I then transported it in this floral taxi to the grass and other nearby daffodils, most of which were unfortunately almost over by now. The bumblebee was turning and crawling in and out of the daffodil, making me wonder if there was no food left inside the flower. Then I remembered the ice cream I was holding in my other hand: almond and honey flavour no less! I placed a couple of drops of ice cream right next to the bee, and it strode right over, stuck out its tongue-stalk-thing and began lapping up the ice cream. It looked so relieved! I don’t know if my bumblebee made it home alive, but at least if it didn’t its last meal was delicious. I’m not advocating ice cream as the correct substance for bee roadside assistance. ; it’s just that that’s what I had to hand. A little honey or sugar diluted in water is probably far more appropriate and less likely to clog up wee apian arteries. Now snails, on the other hand, are deservedly unloved beasts. They crawl about our back patio in a most inefficient way, leaving swirly curly trails behind them. Why they don’t just go in a straight line I have no idea. Anyway, this morning I discovered they have been eating my seedlings. I am furious! My beautiful-to-be tub of night phlox and cornflowers all chewed up by these beastly molluscs. 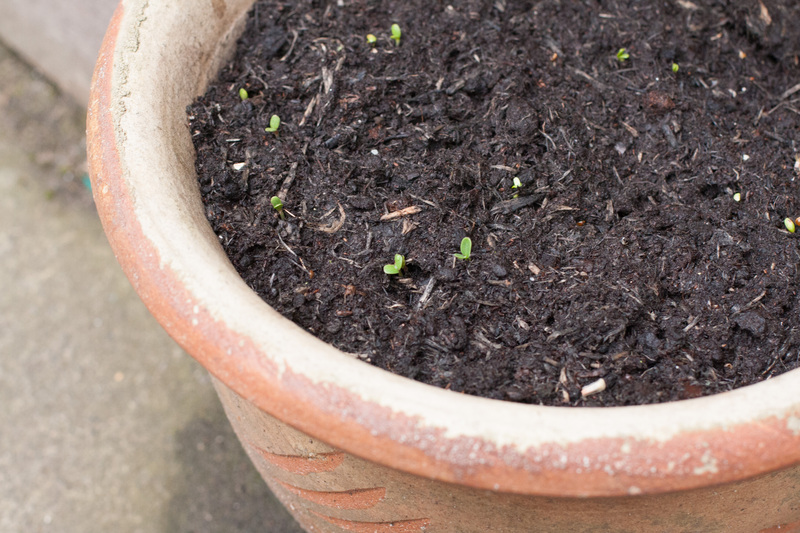 I absolutely will not have pesticides in my garden, but did you know coffee grounds are an excellent way of deterring snails from your dearest plants? The Brazilian drinks a lot of coffee, and he stores the grounds in a pot in the fridge for me to scatter on the garden. A good sprinkling over both tubs of seedlings and across the bed of stocks should do the trick. I’ll report back.